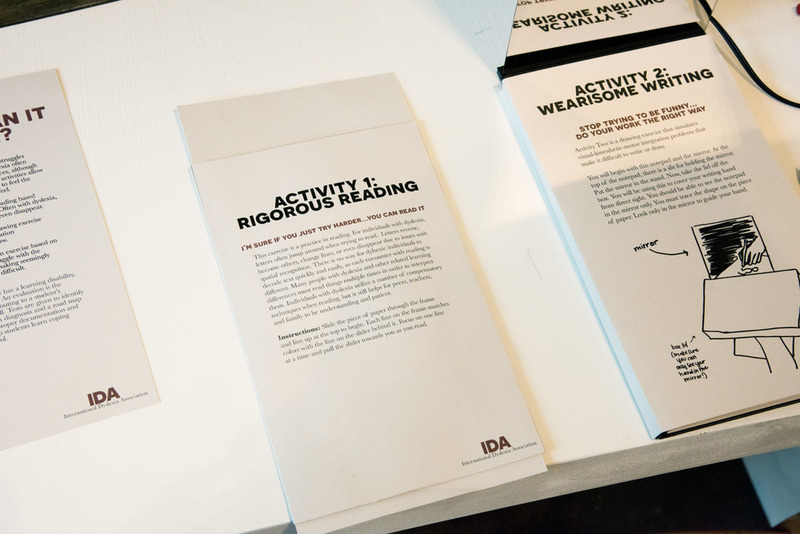 This project is designed for the International Dyslexia Association, an imagined client. The toolkit is made for use by teachers, school guidance counselors, students, and parents. This activity shows the difficulty individuals with dyslexia face when reading. The inner piece slides among the cutouts, and you are to read the story line by line. This activity imitates visual-motor-integration difficulties. You are to trace the image on the notepad looking only in the mirror. The lid of the toolkit box may be used to block your writing hand from sight, so you're not tempted to cheat. This activity is a listening exercise. You are to take a spelling test and write down all 12 spelling words. The recording cuts in and out, distracting you with other classroom noises.